Danielle Bregoli Peskowitz is an American rapper/social media personality. She became a viral sensation after appearing on the Dr. Phil show with her mother, and saying her now world famous catchphrase, ‘Cash me outside, how ’bout that?’. Bregoli’s success has been widely judged by others, majorly due to the reason why she was on the Dr. Phil show in the first place. However, she’s proved that she’s actually a very talented individual; and used the publicity to build a following, and a career. As of 2019, Danielle Bregoli’s net worth is estimated to be $3 million. Danielle Bregoli was born on the 26th March, 2003, in Florida, United States of America. Her mother Barbara practically raised Danielle on her own, with no help from Danielle’s father, who’s a deputy at the Palm Beach Police Department. Danielle is still only 14 years old, which kind of brings her early life and career into one section, but we’ve kept them separate anyway. She was 13 years old when she appeared on the Dr. Phil Show, as her mother was tired of her behavior. You can pretty much gather all the info you need to know from the title above. Needless to say, her behavior was a big issues for her mother, and that’s why they appeared on the show. Whilst on the Dr. Phil Show, Danielle said the words, ‘Cash me outside, how ’bout dat?’ in a response to the audience’s laughter. It didn’t take long before it went viral. Memes were being created, remixes, music videos, you name it. Even mobile games were created, without Bregoli’s permission, after which she sued the developers for trademark infringement. Most viral sensations only last a month or so, and then they disappear from the web. However, Bregoli took this opportunity to build a social media following, and start her own clothing line. She quickly racked up millions of followers, and began charging for social media shout outs, as well as guest appearances. Most recently, she’s released several music videos, which have racked up millions of views, and sent her career in a new direction. Say what you want about the way she achieved her fame, but she knew exactly what she was doing in building a following and a 7 figure income. Danielle Bregoli has been judged heavily after achieving fame through appearing on Dr. Phil as a rebellious and rude teenager. However, the way she’s managed to achieve this net worth still takes skill and effort, despite viral fame. As of 2019, Danielle Bregoli’s net worth is estimated at $3 million. 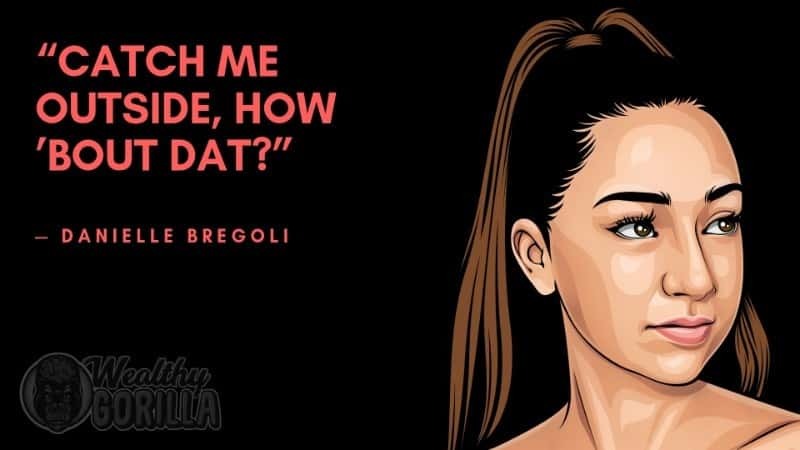 What do you think about Danielle Bregoli’s net worth? Leave a comment below.